Phineas Pett was an English Master Shipwright in the first half of the Seventeenth Century. He was also a sea captain, Cambridge graduate, a bit of a rogue and a bit of a dandy, a vicious enemy to his rivals and, that greatest of virtues for any historical figure, an autobiographer. He is probably less well known than his son, Peter who sat on the Navy Board with a more famous diarist, proving that on the path to historical imortality in the Seventeenth century, passing acquaintance with Pepys counted more than the patronage of Kings. He interests me in a number of ways. Firstly, shipbuilding was a large scale industry in a still largely rural society where manufacture was almost entirely based on small, family sized businesses. Chatham shipyard on the employed 800 people in 1665, at a time where there was only a couple of dozen towns of more than 5000 people in England. Shipbuilding was at once large scale and high-technology and required people of with both technical and managerial skill to lead them. This technical manager fits well into our concept of post industrial revolution, or even entirely modern industry, but is harder to place in early Stuart England. Further he is very hard to place in terms of class. Different aspects of his life, as well as different times showed traits of the fairly poor wage earner, of the artisan and of the minor gentry. His “class” (with due regard to the difficulties associated with using the word in the 17th Century) was either very amorphous or there was considerable potential for mobility between the classes. Was this typical, or was it peculiar to his unusual, almost anachronistic profession? Add to this the fact that my wife’s family is replete with Petts, a connexion I have not yet manage to establish or debunk, and quite a novel controversy about attribution of portraits and there is plenty of potential in Phineas. I intend to come back to him from time to time in future and look at aspect of his life in more detail, but for now, let us quickly sketch out his life. 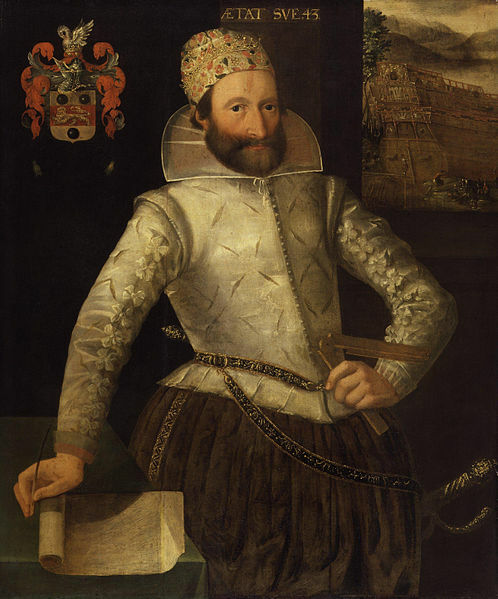 He was born in 1570 to Peter Pett a prominent shipbuilder, by his second wife, Elisabeth. The Petts were already and established shipbuilding dynasty, claiming (whether entirely correctly or not) that the Petts had been shipbuilders “since Henry the Seventh’s Time” and in royal service as shipbuilders “for the space of two hundred years or more” and over the next two generations would proliferate through the shipbuilding profession. As you will all doubt know from your intimate knowledge of Exodus, Phinehas was a High Priest of Israel and as Phineas was sent to Emmanuel College Cambridge it seems likely that whilst his older brothers were intended to follow in his father’s footsteps, Pheneas was intended for the church. However, whilst Phineas was at Cambridge Peter died and his mother remarried to an unscrupulous churchman who robbed him of his inheritance, forcing him to quit university. His half-brother, Joseph who had taken over his father’s patents, refused to give him any preferment and he worked “to very little purpose” for another shipwright before going to sea on an unsuccessful privateer on the Levant. He returned in some penury, but managed to find employment “as an ordinary workman” with Mathew Baker, possibly the most significant shipwright of the previous generation. Baker would later become a bitter enemy to Pett ( a man who seemed to gather enemies), but it seems he taught Pett his profession at this time, Pett studying the mathematics which was becoming an increasing part of a shipwright’s skill at night. From here, Pett’s career began to take off. Although there is little doubt that he had considerable ability he secured advancement by patronage. From an early age he dressed “in very good fashion, always endeavouring to keep company with men of good rank far better than myself”. He secured the support of the Lord High Admiral, Howard and later of the King, James and Princes Henry and Charles (later Charles I). He progressed, being eventually receiving his charter as Master Shipwright, and Commissioner and was the leading light in the (ultimately failed) Company of Shipwrights. His was a time or arguably rapid evolution, rather than revolution in warship building, but he built a series of increasingly large and complex vessels, including the Prince Royal and his son Peter, built the Sovereign of the Seas, the largest and most ornate English ship of its time under his direction. His autobiography ends quite abruptly with the commissioning of the the Sovereign but he continued to draw a royal salary until his death in his 77th year. He is a difficult man to like in many ways. He was certainly corrupt he didn’t come out of a royal investigation into dockyard graft as well as his autobiography would have us believe. He certainly couldn’t have lived as he did on his official salary. Whether he was was extraordinarily corrupt or just ordinarily so is a matter for debate. He made a lot of bitter enemies in his time, some of them, especially Baker former friends, and many within his family but was also very loyal to others. I hope you will excuse the brevity of this sketch, but I will return to aspects of his life and times in more detail periodically and his full biography, with some excellent introductory material is available free online.